Healthy eating includes eating nutritious foods, but it also means limiting foods high in ingredients, such as salt, that can affect our health when consumed in excess. Most of the sodium we consume is in the form of salt, and while the body needs some sodium, too much can contribute to high blood pressure and heart disease . The 2015–2020 Dietary Guidelines for Americans recommend that Americans consume less than 2,300 milligrams of sodium per day as part of a healthy eating pattern. However, nearly 90% of Americans consume more sodium than is recommended. Most of that sodium is found in places other than the salt shaker, such as processed, packaged, and restaurant foods. The good news? There are easy, manageable ways to lower your sodium intake at home, at the grocery store, and in your community! For National Nutrition Month® 2017, Million Hearts® is encouraging Americans to reduce their sodium intake and make healthier meal choices. 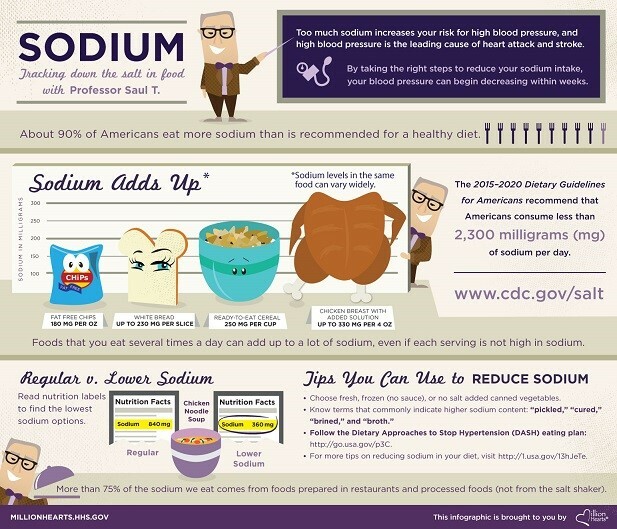 All month long, we’ll be sharing sodium-savvy tips and resources to incorporate into your meals! Follow Million Hearts® on Facebook and Twitter. Retweet and share our #NNM posts.